Managing product Intellectual Property (IP) and Bill of Materials (BOMs) throughout the product lifecycle has become even more critical in today’s competitive business environment. Design, testing, manufacturing and services processes, which are often conducted in different sites scattered geographically, must all be synchronized to allow for end-to-end traceability needed for issue resolution. To support a “Design Anywhere, Manufacture Anywhere, Service Anywhere” (DAMASA) business model which offers out-of-the-box functionalities, that enhances the company’s adaptability to ever changing business models and markets drivers. 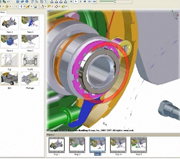 As part of the comprehensive Product Lifecycle Management offers, the Cross Functional Bill of Materials (BOM) Management solution enables companies to handle Bill of Material management across the product lifecycle -- from as-Designed to as-Manufactured, as-Planned, and all the way to as-Built and Serviced stages. The solution gives globally dispersed organizations access to Bill of Materials and other information related to product development activities and facilitates real-time collaboration among all engineering disciplines. By standardizing product development processes across diverse organizational teams and the supply chain, best practices can be implemented across the enterprise to maximize efficiency, while reducing costs and time-to-market. In addition, the Cross Functional Bill of Materials (BOM) Management solution facilitates global part re-use and standardization to assure optimization across product management, design, manufacturing and procurement processes.